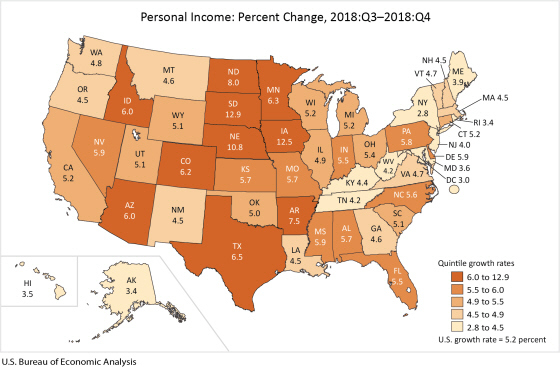 Arkansas total personal income surged at an annual rate of 7.5% in the fourth quarter of 2018, outpacing the U.S. growth rate of 5.2% and ranking as the 5th fastest-growing state in the nation. The sharp increase was largely attributable to spike in farm income, which increased at an annual rate of 385%. The increase in farm income was not unique to Arkansas: The only states to outpace Arkansas’ growth rate in the fourth quarter were the agricultural states of South Dakota, Iowa, Nebraska and North Dakota. 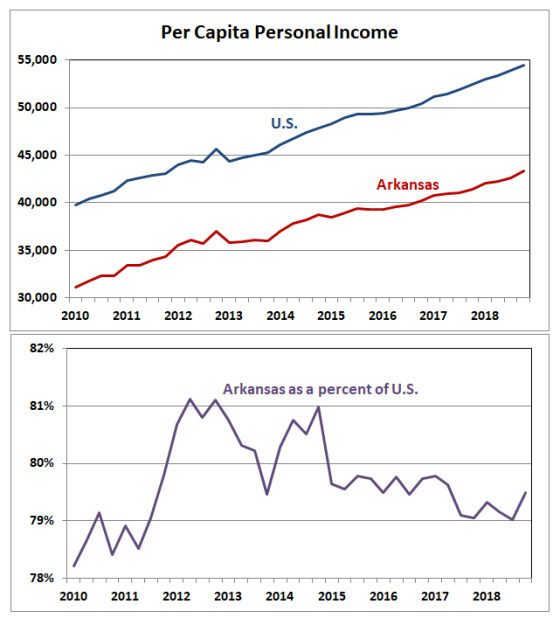 Even without the volatile farm income component, however, Arkansas personal income increased at a rate of 4.7% — essentially the same rate as the U.S. total. Today’s report from the Bureau of Economic Analysis also included revised quarterly estimates for 2018:Q1-2018:Q3. 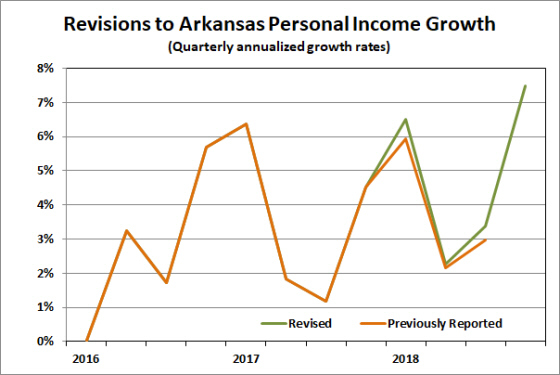 As shown in the figure below, Arkansas growth was revised higher in each of the first three quarters of the year. The cumulative impact was to increase year-over-year growth by about one-quarter of a percentage point. 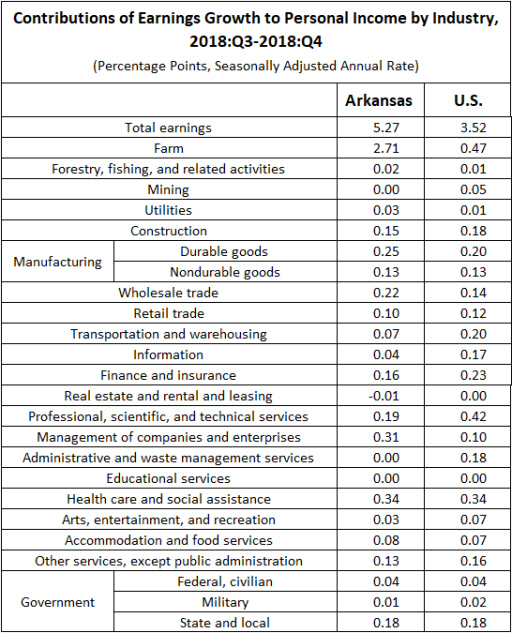 Total earnings contributed 5.27 percentage points to the Arkansas personal income growth rate in the fourth quarter. As shown in the table below, about half of that growth contribution was attributable to the farming sector. Other notable contributors included Health care and social assistance, Management of companies and enterprises, and Durable goods manufacturing. The fourth-quarter surge in personal income translated to an uptick in per capita income, which reached $43,312. This figure represents 79.5% of average per capita personal income for the U.S.